Your concession stand features nachos and you experience delays and loss in sales because you can’t keep with the demand of these crunchy items? Looking for a solution? Nachos Chip Warmers are the perfect solution for your concession stand! This equipment helps you increase the appeal of these cheesy chips. They keep nachos warm and allow you to serve this irresistible food item at the perfect temperature. Now, onto the tough choice. Which chip warmer should you buy? With 44 gallon capacity, El Primo is a thermostatic temperature controlled chip warmer. This equipment features a double pan door which takes the form of a shelf in order to ease the process of chips loading and reduce breakage. The lower door opens to help serving of the crispy, crunchy chips into baskets. Made of stainless steel with insulation, El Primo is highly durable. The heating systems maintain constant temperatures which move the heated air throughout the equipment’s interior. Regular maintenance is required in order to offer fresh chips every time to customers. Pass Thru also comes with 44 gallon of capacity and thermostatic temperature control. This chip warmer is specifically designed for free stand-ins, fitted into wall openings or for a countertop service. Pass Thru can also be installed to different portable stands. This model also features a double pan access door that opens as a shelf and eases the process of leading chips. With the help of special interior baffle, the flow of chips is smooth without any breakage and in top condition. 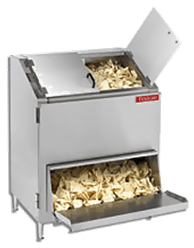 Chip Master has 22 gallon capacity along with thermostatic temperature control for decreased operating costs. This thermostat offers a high temperature control limit which helps in preventing overheating. The front door can be removed for quick and easy cleaning. You just need to unlock the latches, and get rid of bottom panel to wipe the surfaces with a clean cloth. All Texican products are sold with a one year product warranty. Looking to get one of these? At Chef’s Deal Restaurant Equipment, we offer a wide variety of restaurant equipment for sale. Our online store features used restaurant equipment in top condition at extremely affordable rates.